Learn about this new platform designed for external consultants to help solve harassment issues, free to employees. Many of us need this now. We know, we had you at Weinstein, Spacey, Lauer...Take The Lead Leadership Ambassadors Tabby Biddle and Elisa Parker launch the new initiative 50 Women Can Change The World in Media & Entertainment. Nominate or apply by Dec. 10 here. Project100 helps volunteers connect to women candidates run for offices nationwide with all levels of support. Lively workplace discussions don't have to be destructive, learn how. Gloria's "The Sum" Weekly Column: Word of The Week Is Complicit. Nominate a woman by December 10 for 50 Women Can Change The World in Media & Entertainment, a four-month leadership and movement-building program focused on closing the gender leadership gap and changing the culture in Hollywood. Learn more about Take The Lead's 50 Women Can Change The World in Media and Entertainment from Gloria Feldt, Take The Lead co-founder and president, and Leadership Ambassadors Tabby Biddle and Elia Parker. Payouts may be higher than you imagine. Quick tips that can help shape boys into feminists. The consumer goods giant is supporting women of color in big ways. Check in with five ways to stop apologizing for your career success. Check out available programs for anyone aiming for a career in finance. Get inspired by these letters from mom entrepreneurs to their daughters. 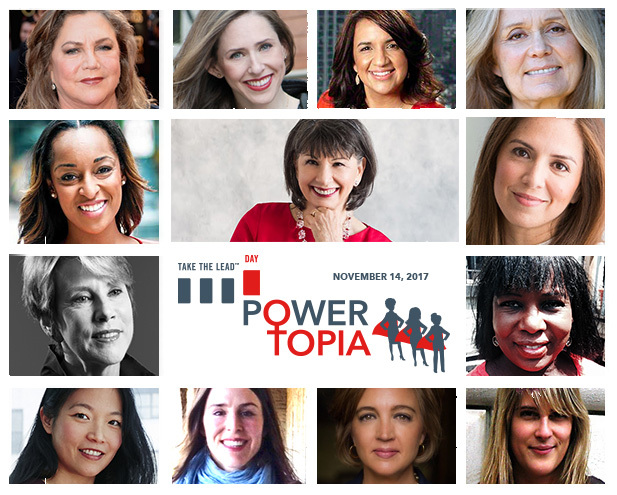 WATCH the Powertopia events from around the country here in livestream. INVEST IN YOURSELF—REGISTER for the NEW Power To Lead: 9 Leadership Power Tools to Accelerate Your Career online self-study course here. BRING Customized 9 Leadership Power Tools Trainings from Take The Lead to your company or community — learn how here. DOWNLOAD your Personal Action Plan here and take action to increase your skills, knowledge and intentions around leadership and power. Lyft is driving all of us to gender parity with donations to Take The Lead. When new users sign up with Lyft and current Lyft users type the code TAKETHELEAD17, Lyft will donate $10 Take The Lead through November 2018. Tell your friends and encourage them to use Lyft, because every donation helps Take The Lead get closer to its mission. When you support Take The Lead’s mission of gender parity by 2025, you ensure more women gain access to leadership training programs and free resources like our breakthrough training, Virtual Happy Hour role model programs and this newsletter. You help yourself, your daughter, sister or friend get fair opportunities and the skills to succeed. It’s easy; please text TAKETHELEAD (no spaces) to 41444 and make your donation today.